With the general release of the Irisys Vector 4D™ people counter now approaching fast, we will be writing a series of blogs about the technology and development of the most advanced and capable people counter ever created, the Vector 4D™. One of the exciting capabilities of the new time-of-flight technology is extremely accurate height measurement of the people that are counted. In a real-world setting this gives operators data they can use to estimate the numbers of adults and children entering their venues. Since most children aren’t in a position to make a purchase in stores, including their numbers in conversion calculations may make a store appear less effective at converting visitors into paying customers, so it helps to make the data as useful as possible. 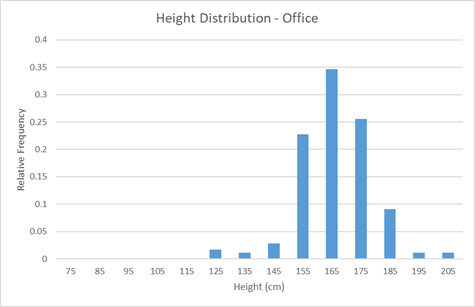 This shows the typical Normal distribution of heights you’d expect from the adult UK population statistics. The smaller targets are probably due to people working around the monitored area (bending down etc. ), and the distribution is a little biased towards the taller male distribution representing the male/female ratio of our employees. This again shows the Normal adult population distribution, but this time skewed with an extended tail on the low end. This is due to the presence of teenagers and children in the population. This is probably a pretty typical retail environment and highlights the difficulty in setting a single height threshold to ignore children. We found that the frequency of children could vary substantially depending on the day of the week, and whether it happened to be a school holiday week. 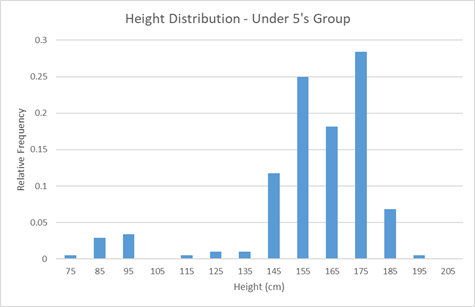 In this scenario, the population consists of adults and under 5’s, so two distinct groups with very different height profiles. The main peaks represent the adults present, and the independently mobile toddlers give rise to a clear second peak around the 90cm height point. In this scenario it’s much clearer where a threshold might be placed, and it’s a great illustration of the histogram’s power to tell us about the makeup of the population. These different graphs show the varied data patterns created by different demographics, and how the Vector 4D™ produces highly accurate and detailed data in each. Unlike many other people counters which can only make an estimate of height and ignore people that do not exceed a pre-defined threshold, the Vector 4D™ gives you a complete picture to an unprecedented level of accuracy. It means that end-users are the ones who decide what to do with the data, and nothing is arbitrarily excluded.